It comes as the youngster’s second UCI Track World Cup gold medal. Downey has won back-to-back golds at the last two World Cup events. DOWN NATIVE MARK Downey has won a gold medal in the men’s points race in the third round of the UCI Track Cycling World Cup in Colombia. Subsequently, he now leads the World Cup ranking in this event with this morning’s medal coming as his second consecutive gold, having won in Apledoorn in November. The 20-year-old Dromore man put on a dominant performance in the Alcides Nieto Patino Velodrome in the early hours of this morning to storm to victory. He took three sprint points in the 120 lap race, and lapped the field. He adds this title to his already impressive collection in this event, having won silver in the European Championships in the points race as both a junior and U23 rider. Since joining the elite team, he has powered to lead in the World Cup rankings. “It was my first time racing at altitude so I needed to be careful,” he told Cycling Ireland after the race. “My pre-race tactic was to chill for 30-40 laps and then to come to the front and turn the gas on. “I made three key moves in the race – I got away with five riders and took 5 points in the sprint, then the big guys got away shortly after that and I used the rest of the bunch to bring them back. He was understandably delighted afterwards, and now has his sights set on the World Title in April. Meanwhile, Dublin-born Lydia Boylan was also in action in the Women’s Omnium. She had a fantastic start, winning the first event, and progressed to finish sixth overall. Eoin Mullen is in action today in the men’s keirin, while Lydia Gurley is in the women’s 10km scratch race. Email “Ireland's Mark Downey wins gold at Track Cycling World Cup event in Colombia ”. 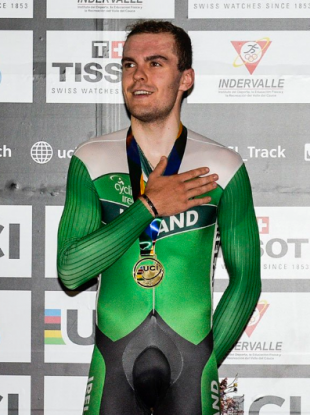 Feedback on “Ireland's Mark Downey wins gold at Track Cycling World Cup event in Colombia ”.